Sometimes when another Russian-flagged vessel either becomes a pirates' loot or is detained by local authorities, press and community ask rhetorical questions like "could anybody presume to touch a Soviet-flagged ship?" Not exactly. Soviet ships (just like American, British and other ones) from time to time also happened to be victims of now-called "pariah regimes", various rebels, regional wars, conflicts, sabotages, and terror acts. Sad story of Soviet tanker Tuapse is by no means a solitary example. However, now we're going to talk about different thing. The subject matter is how Soviet naval servicemen used to release our fishing vessels and crews. Take note that bringing up to $2 bln per year, fishery had always been in the center of Soviet government's attention. Soviet trawling fleet with roughly 4,000 ships became the world's biggest one not later than in 60-70's and worked literally all across the globe – near Africa, South America, New Zealand, Canada, in Antarctica, Pacific and Indian oceans. Our sailors carried out fishing activities in the waters of 25 countries, getting abroad 5.5 mln tons sea products out of overall 10.4 mln tons caught by Soviet fishery. By the way, underdeveloped and developing countries willingly let Soviet fishing ships into their territorial waters, just because the USSR was not striving after abnormal profits and oriented to long-run relationship but not to up-to-the-minute benefits. It is no wonder that a reasonable question arose very soon – how to protect all these assets in such imperfect and restless world. And only the Navy could settle problems wherever prestige of a superpower was not enough. Although our naval servicemen were not involved in anything like known cod-and-herring wars, they had contributed much to protection of national fishery interests. On February 24, 1966 when Ghanaian president Kwame Nkrumah was visiting Beijing, a cabal of mean-ranking officers made a political coup. Relations with Moscow were shut down, and all officials from socialist countries were deported. Soon rebels captured Soviet scientific ship Ristna which was literally farced with top-secret equipment. On January 28, 1967 two Ghanaian frigates dropped assault teams on board Ristna which was staying off the port of Takoradi. However, the radioman managed to report of the attack, and Soviet foreign ministry got in the matter. As it turned out, the reason for assault was reports of local media sources that Ristna allegedly carried "arms for terrorists". Naive Africans took no notice of secret space communications equipment. Besides, it was found out that chief mate of Ristna and commander of Ghanaian coast guard unit used to study together in Moscow, so the official action slipped into a friendly party. Our ship was released soon. Nevertheless, in October 1968 Ghanaian Navy captured two trawlers of Sevastopol fishing expedition – Holod and Veter – in the Gulf of Guinea. All sailors were thrown into prison of Takoradi port. The pretence was violation of 12-mile zone, but the witnesses said about provocation. Ghanaian frontiersmen were raking for arms in the fish holds. Our sailors had spent half a year in the prison. Diplomatic attempts to release the ships and crews were useless. Then it was decided to involve economic levers. Late in January 1969 the USSR cut off supplies of oil products to Ghana. No effect again. While in prison, Soviet sailors were tormented and jeered in different ways. Captors did not give them food and water for several days. Jailors porked out, drank and had fun with hookers in front of jail cells – obviously, trying to show their indignity. At last, after abortive attempts to settle the problem by diplomatic and economic pressures, Soviet leaders decided to use the Navy. A task force was formed under command of Capt 1 rank Platonov, 5th Squadron executive officer. The force consisted of ships from three fleets. Northern Fleet delegated Project 641 diesel submarine B-26 Yaroslavsky Komsomolets; Baltic Fleet – Project 56-M large guided missile ship Neulovimy; Black Sea Fleet – Project 57-bis large guided missile ship Boiky and supply vessel Olekma. That was the first-ever Soviet naval force dispatched to West Africa. The ships joined each other off Morocco and in February 1969 the force reached Ghanaian coast. Leaders of this country had much to think about, since the tiny Soviet flotilla was far stronger than the whole Ghanaian navy. Having arrived at the destination, the flagship broadcasted a menacing warn about "probable consequences" of further detention of the trawlers and crews. Remaning off Takoradi, the warships demonstratively started to prepare for missile launches. The situation was warmed up with the fact that Soviet antiship missiles Schuka was also capable to destroy land targets. Being afraid of catching a 3-ton missile, Ghanaian ships tried not to appear in sight. Large missile ships were a vigorous argument, so Ghanaian leaders freed Soviet trawlers and crews on March 3. However, both shipmasters remained under arrest, because they were still charged of conspiracy. In March 5-10 some of the warships left for Nigerian port Lagos to pay a "courtesy visit" – use of the naval force as a pressure tool against Ghanaian government was not officially disclosed. By the way, one of few known precedents of Soviet sailors' getaways happened then in Lagos. An enlisted radioman tried to escape from Boiky; having jumped off the ship, he reached a British vessel by swimming. However, Nigerian pilot noticed him and reported to Boiky's commanding officer. Thanks to participation of Nigerian part (the British tried not to extradite the deserter), he was returned back to the ship. Officially, that was said about an accidental event – the sailor allegedly slipped and fell overboard, and the British detained him by force. The runaway confirmed this version at a press conference, although was locked up for seven years upon returning to the USSR. The warship's command also suffered. At last, the shipmasters were released on March 19, and the warships returned to basing sites. By the way, large guided missile ship Neulovimy was then transferred to Black Sea Fleet. 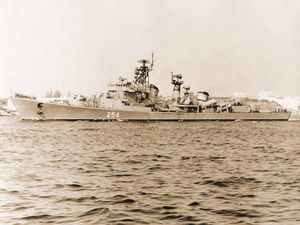 Apart from other things, the Ghana incident showed that our Navy is capable to conduct effective operations far away from native territorial waters without use of aircraft carriers and having no large naval bases overseas (nonetheless, since 1971 Soviet Navy had a permanent basing site in West Africa – in Guinean port Conakry). After that incident no one ventured to detain our ships for years – right until upheaval in Chili in 1972. Early in 70's Moscow and Santiago signed a number of agreements on joint fisheries. Among other things was scientific search for fish in the interests of Chilean fishers – that was just what research vessel Ekliptika did. But early in September Ekliptika took reefs off Valparaiso. After that a part of the crew was sent home by air, and 13 men with shipmaster Vladimir Afinogenov stayed on board to repair damages. On Sept 11 the military coup occurred in Chile, and the Hotel Pratt where our sailors lived was assaulted by Chilean black-bereted marines. The crewmen were tied and put in a military truck's body. At first, they were brought out of the city to a sand pit where the "execution" was staged. Having bullied enough, captors brought our sailors to notorious National Stadium in Santiago which was a sort of a concentration camp then. Soviet sailors witnessed mass killings and tortures of those who had the misfortune to be out of favor of new Chilean leaders. Then sailors were brought to a naval port. Revolutionaries transformed training sailer Esmeralda and cargo ship Maipo into floating prisons. They clubbed and bayoneted Soviet sailors for hours and then threw them into the ship's hold. It should be kept in mind that the conflict could have more serious consequences if Soviet warships happened in Chile during the putsch. Submarine mother base Ivan Kucherenko (Project 1886) with cadets of Pacific Naval Academy was supposed to pay courtesy visit to Santiago in mid-Sept along with supply vessel Vishera. Apart from cadets, a marine band of 390th regiment was also aboard. The cruise was personally headed by Pacific Naval Academy Commander Vice Admiral Boris Potekhin and his deputy Capt 1 rank Viktor Postnikov. As recalled by the then Pacific Fleet deputy chief of reconnaissance Anatoly Shtyrov, a commando team with electronic reconnaissance equipment was detached to the mother ship; by the way, marines knew Spanish perfectly. Right after the news of the coup the ships hove aback and only after 3 days they were ordered to head for Peru. Formally, "with a program of official call". And then Ekliptika and the crew were released. Officially, as a result of menacing diplomatic notes from Moscow and with assistance of French Red Cross. But really, Chilean military leadership was warned off-the-record via diplomatic channels of third countries that all Chilean vessels in Soviet and allied ports [they were seven] would be detained unless our sailors are immediately released. And if that would not help, Soviet Navy had a right to capture all Chilean-flagged ships wherever possible in accordance with reprisals provided by international law. Boatswain of Ekliptika Vasily Medvedik even testified as a witness at sessions of Helsinki International Committee investigated crimes of Pinochet's regime. In 1977 a long-standing conflict between Argentina and Britain around Falkland Islands escalated again. Argentineans decided to confirm their dominance in the disputable waters by expelling all foreign fishing ships. Light aircraft carrier Veintcinco de Mayo, cruiser General Belgrano and four destroyers took part in the operation under personal supervision of Admiral Emilio Eduardo Massera, Argentine Navy Commander and the junta member. Ironically, most victims of the new "fish war" were Soviet vessels. On September 21, 1977 an Argentinean destroyer captured Soviet refrigerating factory trawler Apatit. Boarding party interdicted the crew from any movements, planted machineguns in passages and on the deck, sealed the hold, radio room and broadcasting centre. The captors rummaged cabins, crew quarters and even busted the safes (it is not clear what they wanted to find there). Also, they confiscated the ship's logbook and charts – apparently, as evidence. Shipmaster Tsymbaliuk and all his assistants were held in the chartroom at gunpoints. Soviet trawlers Bussol, Teodor Nette, and Magnit were also captured in the same day. Five days later, on September 26, Argentine Navy detained another Soviet trawler – Nerei. By the way, coordinates reported to our sailors in the moment of arrest (the only time when Argentineans gave coordinates at all) showed that the ship was out of 200-mile economical zone of Argentina. But that was not the whole story – on October 1 Argentine admirals looted Murmansk refrigerating trawlers Prokopievsk and Frans Gals. Meanwhile, Prokopievsk was not fishing at all but anchored dozens miles away from the disputable zone repairing powerplant. Bulgarian trawlers Ofelia and Aurelia were detained in the same day. Argentine representative in the UN declared that his country would take analogous actions towards "any other foreign vessel wherever". It should be noted that South Atlantic was a pretty "hot" region then, and conflicts over boundaries of economic zones became regular. For instance, few months before the incident an Argentine destroyer opened gun fire at a British vessel trawled in the disputable waters. Besides, dictatorship of Jorge Videla had driven the country into permanent crisis and tried to seek a salvation in aggressive nationalism, holding territorial claims against almost every neighbor, even "spiritually allied" Chilean regime. Soviet sailors spent 50 days under arrest. Even Argentineans said "they displayed vigilance, moderation, consciousness, and self-righteous belief". Food and fuel were equally distributed among the crews. Sailors carried out daily activities and continued correspondent studies, arranged sport and cultural events. Shipmasters and chief mates held daily meetings to coordinate actions; all holidays were celebrated together. An important nuance must be noted – despite the fact that General Videla openly called himself a fascist, Argentine authorities treated Soviet hostages far better than Chilean junta and even "friendly" Ghana. At last, our vessels were released, although the catch was confiscated. Curiously, that incident had no impact on quite active but non-advertised commercial and economic relations between Argentine and the USSR. Buenos Aires even addressed to Moscow with a plan to buy arms – late in 70's Argentine military delegations visited our country two times searching into potential purchase of Soviet air defense systems. According to quite reliable information, the Soviet Union even provided Argentineans with intelligence information on British Navy's activities while Falkland War of 1982. Moreover, on May 10, 1982 Argentine foreign minister Costa Mendez said during face-to-face meeting with American counterpart Alexander Haig that his country could ask Moscow for military assistance. When leaked in media, this information made a splash in the West. However, this matter remained in words, and the junta had lost the game. Speaking of the incident with captured trawlers, one of its results was that Soviet Navy established a maintenance base in Luanda (Angola) in April 1977. 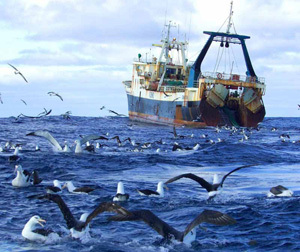 Among other tasks, the base was responsible for protection of our fishing vessels in South Atlantic. Then all the dust settled and Soviet fishermen returned to the Falkland Islands. Old generation must remember plenty of tinned krill meat in Soviet shops. That krill was just from South Atlantic. It should be stated that our fishermen by no means were always "easy meat". For instance, in February 1959 Soviet trawler Novorossiysk was detained by US Navy just at the place where "strange ruptures" of American governmental communication cable had been found. An "expert group" boarded the trawler, although did not discover any suspicious things there. Nevertheless, it was declared that the trawler was engaged in "illegal activities". On March 4, 1959 Moscow officially classified all charges as conjecture, and the trawler was finally released. Leaders of the two countries decided to blanket the incident – especially as Khrushchev's visit to the U.S. was close to hand. During the Vietnam War Soviet trawlers hindered actions of American carriers so much that it became the matter of diplomatic protests. For example, in January 1966 undersecretary of state Mr. Johnson declared a protest to Soviet ambassador Anatoly Dobrynin for actions of trawler Gidrofon which repeatedly tried to frustrate takeoffs from USS Enterprise and USS Kitty Hawk. In January 1968 Soviet trawler Gidrolog blocked the headway of a carrier strike group led by the same USS Enterprise hurried to help American reconnaissance ship Pueblo which was attacked in North Korean waters. This event captured headlines all across the world (except Soviet ones, of course). The carrier even had to stop and move back. Americans were surprised by the courage of the Soviet crew making a 600-ton shiplet maneuver before bows of the 90,000-ton giant. Now it is hard to say what kind of behavior it was – either result of instructions "from above" or display of initiative as solidarity with waging Vietnam. Common sense guides us to the first variant, although lack of evidence makes any version credible. In American media and Russian emigrant press there were even assumptions of some sort of "KGB seiners" crewed with active KGB officers and "heelers". Allegedly, they were dozens if not hundreds; they mixed fisheries with intelligence activities and arms smuggling to anti-American rebels all across the world. Although this idea resembles a Hollywood movie, it obviously does not bear on reality. The last capture of Soviet sailors happened in 1990 – trawler Kaff became one of the first victims of newly-born Somali piracy. Formally, the reason was illegal lobstering in native waters of a local tribe. The trawler was anchored near the coast, 16 men were taken hostages while the rest crewmembers along with a shipmaster remained on board under armed convoy. However, the times of "new mentality" had come, and after two weeks of negotiations our leaders decided to pay $250,000 ransom instead of deploying a squadron in the Red Sea. Consequently, the ship returned home safely.